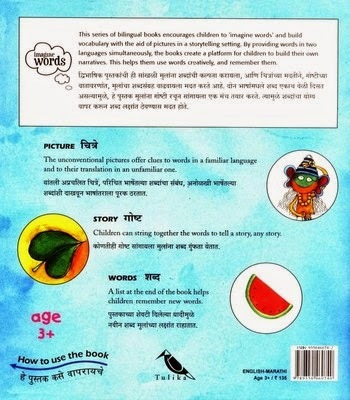 This series of bilingual books encourages children to ‘imagine words’ and build vocabulary with the aid of pictures in a storytelling setting. By providing words in two languages simultaneously, the books create a platform for children to build their own narratives. The unconventional pictures offer clues to words in a familiar language and to their translation in an unfamiliar one. Children can string together the words to tell a story, any story. A list at the end of the book helps to remember new words. A little boy dreams away. . . and becomes a dancer, a potter, a fisherman, a shopkeeper, a cook. . . just about anything he wants to be ! The third in the popular Imagine Words series from Tulika. 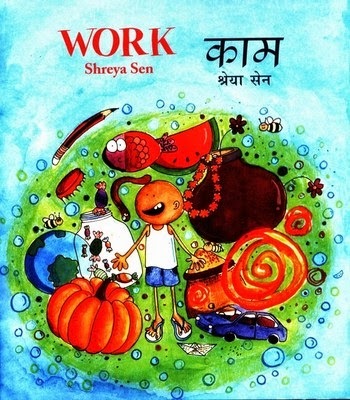 SHREYA SEN illustrated this book while studying animation at the National Institute of Design, Ahmedabad.